This card has me pining for Florida. When I met my husband (through our blogs), he lived in Florida, and I was in Texas. When we got serious, I moved to Florida, and since I was moving to Humidity Central (I hate humidity), I had conditions: 1) He had to get me out of the humidity and to the desert within three years, and 2) He had to get annual Disney passes for us. He fulfilled both conditions, and we went to Disney World a lot. It was awesome. Anyway, this whole card makes me think of two Florida things: Disney’s Haunted Mansion and our friends Jim and Rachel. Here’s a picture I took of Jim and Rachel at Disney at Halloween. The combo of the Modern Medley background paper (which looks like haunted house wallpaper to me), the Antique Brad, and the adorable little skulls on the washi tape remind me of the Haunted Mansion. And anything Halloween makes me think of Jim and Rachel. We met at a blogger screening for Serenity , and within a few weeks, they had invited us to their annual Halloween party. And they do Halloween big. One year, we even received a witch’s finger in the mail with the invitation to the party. They even got married on Halloween. 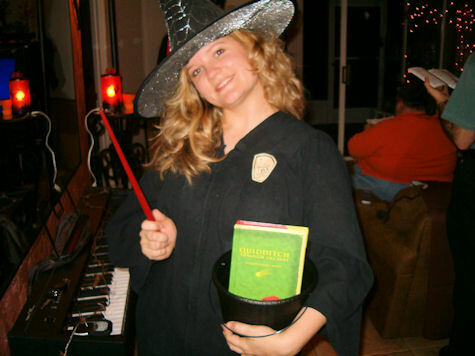 This is me as Hermione Granger at their 2005 party. I don’t remember if Hermione ever read a book about Quidditch, though, so I may have totally botched the costume. BTW, my hair was really curly before the Florida air killed it. So I always associate Halloween with our friends, and I always miss Florida around this time. But not the humidity. Never that. The layout is from the Mojo Monday sketch challenge. There is still time to sign up for my September Stamp-of-the-Month club. You can sign up through email or by commenting at this post or the original post. I will email you back. Next week, we are making a variation of these “spooky” banners in Boise. If you are local, make sure to sign up today if you plan to come next Thursday (RSVP here). If you’re out of town, you can still make your own if you order the Build-a-Banner Kit and the Halloween Banner Simply Created Accessory Kit. 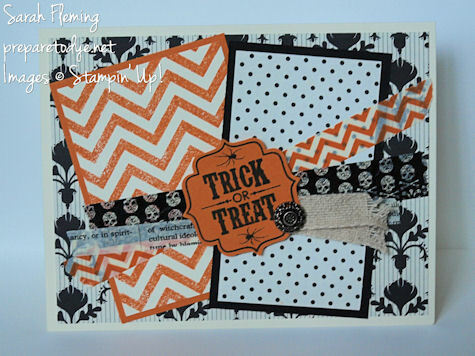 You can shop my Stampin’ Up! store 24/7. Thanks, Rachel! Frank says we can come visit when we get the house paid off. Haha.